True Being has to be born in us, not by demolishing what we are, but by transforming ourselves into what we truly ARE. Within our own body-mind complex there is a capacity to make a quantum leap of consciousness. This is called Transformation. 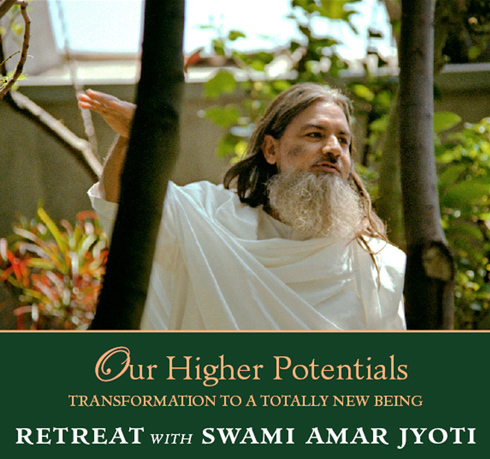 In this Retreat by Swami Amar Jyoti, the way is revealed for an awakening of consciousness that transcends the normal process of seeking. a breakthrough from ordinary consciousness to True Being. ransformation will usher in a new set of laws—both spiritual and scientific—and will ultimately give us the highest level of joy. Gurudeva gives guidance on how to simplify our lives in order to come to peace of mind. The first step is to conserve life force so that gradually the contemplative mind is born; we become conscious of everything we do and higher faculties begin to open. In silence, knowledge reveals the truths and mysteries of creation. We begin to witness life in a new way: we are less affected by ups and downs; we are no longer caught in incessant and debilitating thought patterns. To the degree we achieve stillness of mind, we achieve success in the world, in all of our relationships and activities. The contemplative mind leads to meditation. And when meditation becomes deep and unruffled, like a candle in a windless place, we become qualified for Realization.